UCC Go Club have posted details of their 2013 tournament, which will take place on December 7th-8th. Greetings and Salutations on this fine lovely and wet day! Our first meeting shall be this Thursday in Boole 5 from 6.30 until 8.30 p.m. There will be some Hikaru, an introduction to the game, and some play afterwards! …from the UCC Go Club mailing list. I hope your Summer has gone well and you are all eager to return to the Go Club this coming Autumn. a. Clubs day will be the 17th of Septemeber! If anyone wants to volunteer to help out man the stand, do get in touch. Tuesdays (Practice): WGB_G02 from 7 p.m. until 9 p.m.
Thursdays (Lessons): Boole 5 from 6.30 p.m. until 8.30 p.m. The Tuesday meeting will be a usual meeting for fun , chatting, and playing Go as we did last year. This book is a super read! Two nice places to play online KGS (for this you have to download an application to play) and NOVA (for this you can play in your web browser). My user name is Seanachain in both, if you see me there, invite me to a game! Ok, that’s all for now folks! The venue was the Mardyke Pavilion, which was undoubtedly the best venue the tournament has seen to date. 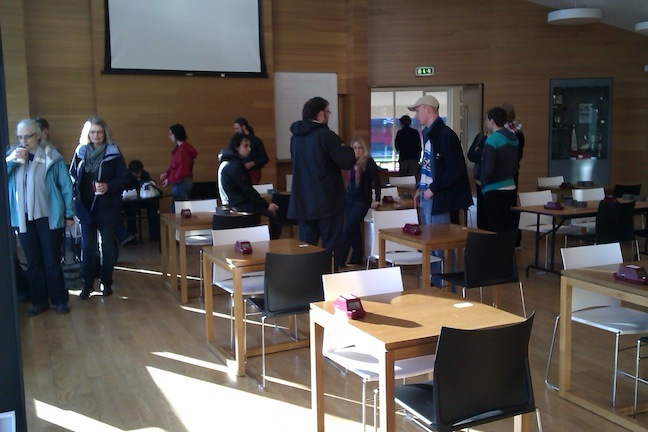 The shot below does not do it justice, although it does capture the colour coordinated chairs ^^ In the foyer, there were two go board cakes, a picture of which can be seen on the NUIG Go Soc’s latest post. A total of 31 players took part this year; the largest ever turnout. A full table of results is available from the EGD. It’s fair to say that the event was a resounding success. A big thanks to Justyna and the rest of the UCC Go Club committee for a job well done! It remains to be seen how they’re going to top this one next year. The IGA has a brief post with results. Coincidentally, the Galway Go Soc will have an extra meeting this week. Karma and all that. The IGA has commented on Ireland’s performance in round 2 of the Pandanet European Team Championship.